Although cats are quite independent, they still need us to look out for them, providing them with food and water, a warm place to sleep, hide and get up high, and making sure they are happy and healthy. Cats are often misunderstood but by brushing up on your moggy knowledge you can make sure you know how to give them exactly what they need. For example, did you know that cats often prefer to live apart from other cats, or that when they show you their tummy, they’re not actually asking you to stroke it? 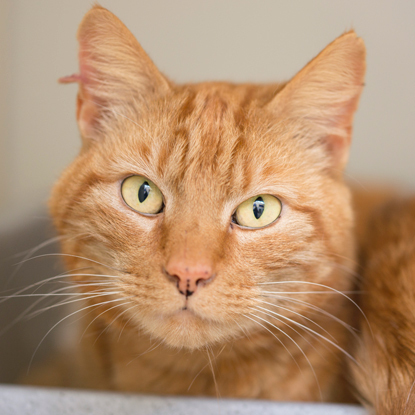 You can find lots more fascinating feline facts on our website, including information on cats’ five welfare needs. Kitties love to burn off some energy by running, jumping and pouncing so if you have a cat at home then they’ll appreciate you taking some time to play with them. You could buy them a fishing rod toy from the pet shop, or make your own enrichment from some common household items – a great activity for kids to get involved in! 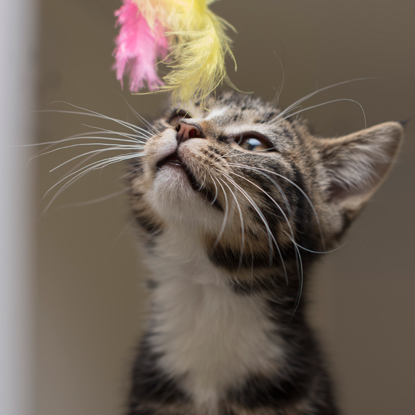 If you don’t have your own moggy to play with, then why not donate a toy to your local Cats Protection so they can use it to give the cats in their care a more enjoyable stay. Getting cats neutered at four months of age really is one of the best ways to show them kindness as you will be reducing their chance of contracting a range of infectious diseases, make them less likely to fight with other cats, stray away from home in search of a mate and prevent them from suffering the stress and dangers of having and rearing kittens. If you have your own cat, then Cats Protection may be able to help towards the cost of their neutering operation, and if you have any unneutered feral cats in your area, then your local branch or centre should be able to help with that too! Cats Protection helps show kindness to around 200,000 cats every year but we couldn’t do it without the support of cat lovers like you. If you have some cash to spare, then we can use it to care for thousands of unwanted cats across the UK until they find their forever homes, and we’ll always keep you updated on how your donation is helping. If you can’t donate money, then maybe you could give some of your time instead by volunteering in one of our many and varied roles. For most cats, there is nothing like a warm and cosy home they can call their own. 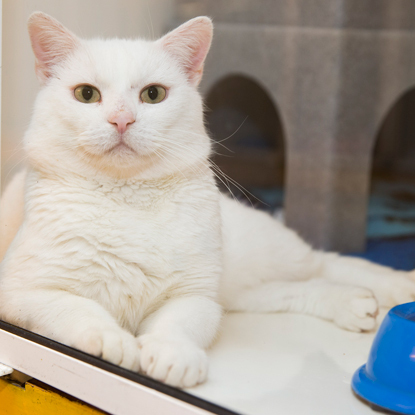 If you can offer a cat their own kitty kingdom, then take a look at our website to find the amazing cats waiting for homes in your area. No matter what your circumstances, we’ll always do our best to match you with the purrfect companion, and you can be sure they’ll come vet checked, vaccinated, neutered, microchipped, and with four weeks’ free pet insurance ready to start their new life with you. How do you show cats kindness? We’d love to hear your stories in the comments below, or on our Facebook and Twitter pages. My rescue cat get spoiled rotten! He loves his cuddles in bed, has more toys than a toy shop and claims my seat on the sofa when I am not looking ��‍♀️ He is content, cheeky, naughty, chatty and very very loving to me! One of our cats loves to steal the warm spot whenever my teenage son moves. I'm sure he only does it because he knows it makes my son laugh and cuddle him. The ultimate kindness to cats... When one cat has cuddled under your knee (or arm) while the other is asleep on top. Your limb is desperate to move but if you do that you will disturb the kitties... So you lie awake all night, until they move of their own accord!